We will be more successful in all our endeavors if we can let go of the habit of running all the time, and take little pauses to relax and re-center ourselves. And we’ll also have a lot more joy in living. We are having a beautiful summer. The days have been a mixed bag of everything—sunny mornings, afternoon rain showers, perfect humidity, warm temperatures, deliciously cool evenings (perfect for a good night’s sleep), terrific storm clouds rolling in from the west in the late afternoons, bringing grand displays of lightning and crashing thunder, and quintessential calm summer days with blue skies peppered with soft animal-shaped clouds and a cool gentle breeze. I love it all. And, so, it seems, does my little balcony garden in the sky–it is thriving! This post is dedicated to my dear friend, artist and photographer, Skylark. The soul cannot thrive in the absence of a garden. 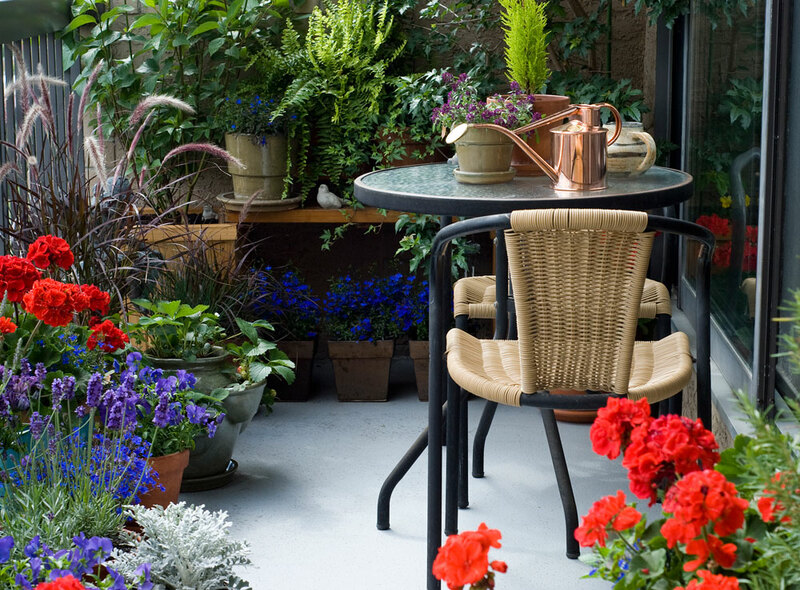 Don’t let a small space, even one in the sky, deter you from gardening. Small spaces can yield a ton of beauty and enjoyment. The pleasure I extract from my small container garden on my balcony—watering it, dead-heading the blossoms and fussing over every single pot—is enormous. I love every plant in every container, big and small. Strawberry Moon is the name the Algonquin North American Native tribes so aptly gave to June’s full moon because they knew it as the time to gather ripening strawberries. Although neither the wild mountain strawberries nor the plump green berries growing in my strawberry pot have yet ripened, our locally grown field-ripened strawberries are starting to flood the farmers markets. 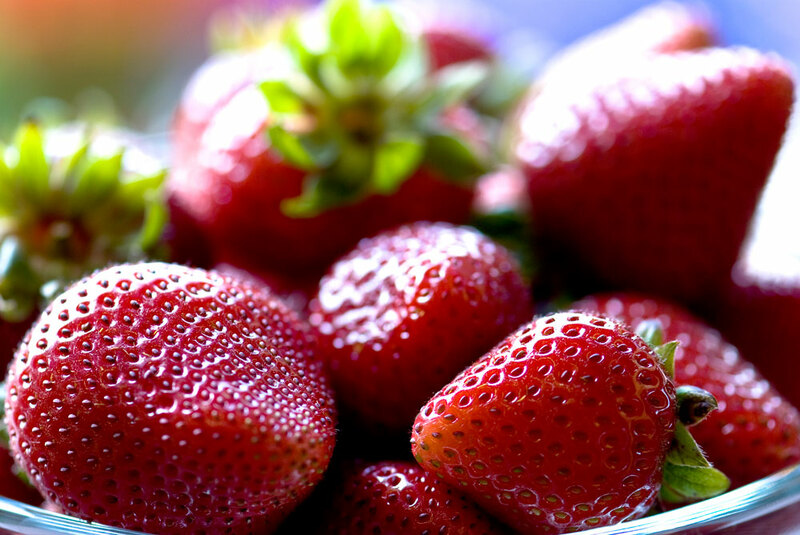 Each year, with my very first bite of that first red strawberry of the season, I am instantly transported back in space and time to a visit to my grandmother’s house as a little girl. 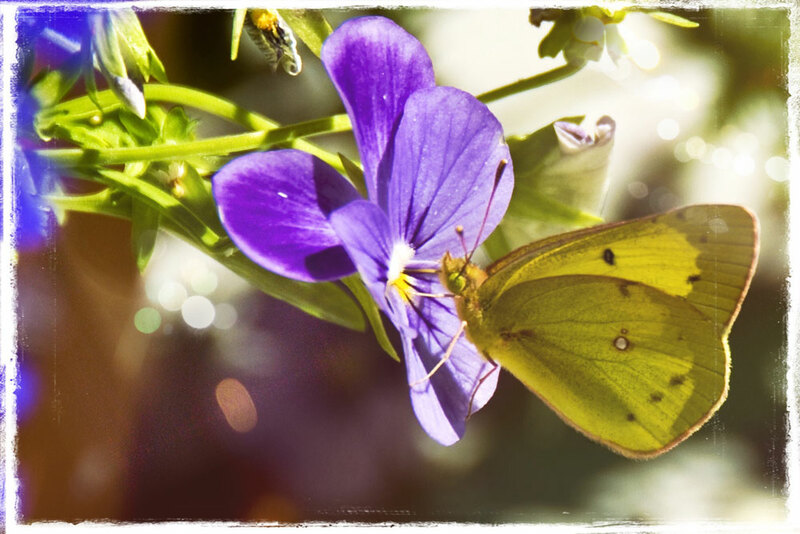 Several summers ago, as I stepped out onto my balcony garden, I literally bumped into my good friend, the Clouded Sulphur Butterfly. It was a beautiful, hot summer’s day and the vertical blinds of our sliding glass doors leading out to the balcony garden were closed to keep out the heat of the late summer sun. I was working in the kitchen when I heard some commotion on the street below. Curious as to the cause of the sound, I decided to step out onto the balcony to have a look-see. But, rather than open the vertical blinds so I could step out unimpeded, I lazily threaded one arm between two of the vertical panels, parted them, and gingerly placed one foot out onto the balcony. Half out, with one foot and one arm through to the other side and my other arm and leg still inside, laced between the vertical panels of the blinds, I bumped smack into a little Clouded Sulphur Butterfly.